MyZone has quickly taken over the fitness industry as a convenient way to monitor heart rate, calories, intensity and time working out. So what’s all the fuss you ask? A MyZone Monitor tracks heart rate with 99.4% accuracy and can store up to 16 hours worth of exercise data. 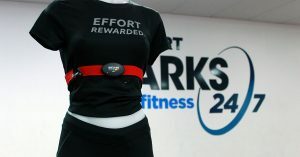 It syncs with your phone and connects to our cardio equipment with Analogue 5.4Khz and Ant+. It’s waterproof up to 10m and lasts up to seven months on just one charge! At Southport Sharks Health + Fitness, we focus on enjoying physical activity and developing a healthy lifestyle. This aligns with the MyZone program, which rewards effort, rather than fitness. A MyZone is ideal for all fitness levels, encouraging the user to consistently engage in exercise to improve their health and ability. The MyZone app allows built-in challenges, gamification, commenting and sharing workouts through social media- creating a strong, supportive fitness community. Live updates are shared on the SSH+F screens, displaying your effort and that of those working out around you. The team at SSH+F love the MyZone product, integrating it into their own personal workouts. If you are interested in using a MyZone Monitor to facilitate your fitness journey, they are available to purchase from fitness centre reception.